If you live in Neston, Cheshire or surrounding area, then there’s a good chance that you will have seen some of our toilet stickers. Since early 2018 they have been steadily breeding in this part of the world. Chester Sandwich Company has them, so too does The Deva Experience and the Grosvenor Hotel in Chester and the United Reformed Church in Neston. Slightly further afield they can be found in the Walker Art Gallery, Liverpool and the Lady Lever Art Gallery in Port Sunlight. If you are registered with Neston Surgery in Mellock Lane, then they are there now too, along with all the necessary shelves, hooks and mirrors in the toilets. We can’t claim any credit for this. Instead, it’s all down to our supporter and local campaigner Bernie. Bernie’s formula for success is very simple. When she goes into a local business or organisation she asks to speak to the manager. She then talks about Colostomy UK and our toilet campaign and asks if they will display our stickers. As well as taking a supply of these, she also has a selection of Colostomy UK literature to hand. Of course, being an ostomate helps too, as Bernie can answer any questions and explain in detail why having a hook and shelf in an accessible toilet is particularly important for people with stomas. According to Bernie, most people she speaks with are more than happy to help. The warden at the church hall in Neston, went straight down to the DIY store for some wall hooks! Even when premises can’t be changed (due to them being listed for example), she finds that owners are keen to do anything they can to help. When I spoke to Bernie last, I asked what motivated her to campaign for us. To be honest, I wasn’t expecting a ploughman’s sandwich to feature in her explanation! Bernie is able to date the start of her story very precisely to July 2017, when she went out for a simple lunch with her sister. Shortly afterwards both became unwell. But, whereas her sister recovered, Bernie was admitted to hospital with a Campylobacter infection. It was while being treated for this, that a scan revealed a large pelvic mass. Initial thoughts were that it was cancerous. Surgery to remove it ended up being delayed until November, as Bernie had lost so much weight from the Campylobacter. She went into the operation knowing that a stoma was a possibility, but the likelihood wasn’t discussed at length. As things transpired, an emergency end colostomy was necessary when it became clear that as well as having extensive endometriosis, part of Bernie’s bowel and bladder had fused together. It was only when Bernie was in the high dependency unit that she became aware of what had happened. I’m sure many readers will identify with her initial reaction: emotional turmoil. She was very unwell, still didn’t know if she had cancer and understandably concerned about what the future might hold, let alone dealing with the practical aspects of stoma management. Her state of mind was clouded further by the memories of her father who had had bowel cancer and a colostomy. At this point, she couldn’t see a way forward. Matters weren’t helped when two days after being discharged she had to be readmitted to hospital because of an infection and a break down in the skin tissue surrounding stoma leaving a gap to one side of it. It was while on the surgical ward that she heard patients coming round from bowel cancer surgery saying: ‘Thank God I didn’t have to have a colostomy’. Moments like this can be a person’s undoing. And, initially, they were for Bernie. Even when the histology results revealed no sign of cancer her feelings of fear and uncertainty about what lay ahead persisted. Still weak from the surgery and weight loss, Bernie spent the next couple of months at home, trying to make sense of what had happened. But, gradually, as she grew physically stronger and her stoma output normalised, her emotional state began to improve. She remembers an early trip out to the shops and afterwards taking her first ‘conversation’ with ‘Bosie’ her stoma. This marked something of a turning point, as for the first time she realised that he wasn’t so bad after all. Indeed, she actually started to feel a little guilty about having hated his presence up until now. Shortly afterwards Bernie enrolled on a locally run ‘Mindfulness’ course where she openly shared her story with others. She also began to attend a support group run by the fellow ostomates in the local hospital’s stoma care department. This was something that just months before she could not have envisaged would ever happen. The solace she drew from this added to the kind attention and support she received from the department’s stoma care nurses. It was around this time that Bernie joined Colostomy UK and started to read Tidings. She had been given a copy of the latter when she was in hospital, but had thrown it away, along with the various information booklets she was given too. As she said, back then it was just too much to take on board. Now however, things were different. 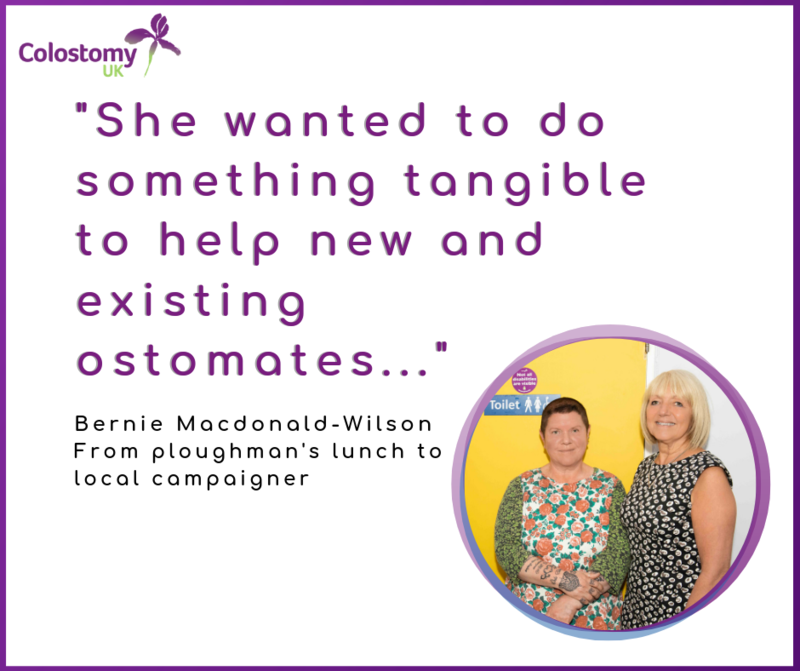 Bernie says that Tidings quickly made her realise that colostomies weren’t just an ‘old people’ thing, nor were they life limiting. Instead from this point onwards, she began to regard a stoma as something that gives life. With this new sense of acceptance Bernie got active and embraced her stoma. She contacted the local council who, on hearing of her medical needs, arranged for two additional bins. She phoned a number of underwear manufacturers for samples and organised some prescription underwear from her G.P. She also started to reflect more on her journey. She thought about all the amazing and brave people she had met in hospital and what they had had to cope with. Ultimately, it was this that inspired her. 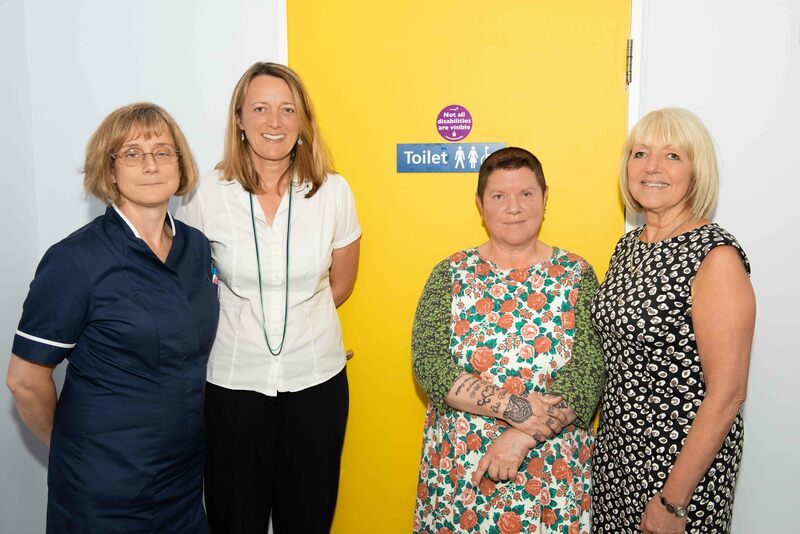 She wanted to do something tangible to help new and existing ostomates and, knowing how important toilet facilities are for people with stomas, saw getting involved with our campaign as the best way to do this. The rest is history. Everyone at Colostomy UK is really grateful for Bernie’s efforts. If you have been inspired by Bernie’s story and would like to campaign with us, then please drop us an e-mail or give us a call.